Our map starts at the Racine Wisconsin birthplace of Paul Harris, then gives you a 90-minute drive south to the RI Headquarters to see Room 711 and Paul’s law office (both are inside RI’s Headquarters), then you can drive past (and someday go into) Comely Bank, and finally down to Mount Hope Cemetery. The trip could be done in half a day, or enjoy each stop with a full day. RACINE is the northern point on the Rotary Heritage Trail. Paul P. Harris was born 19 April 1868 in Racine, Wisconsin. Although Paul spent his boyhood in Vermont, and later traveled tens of thousands of miles in the name of Rotary, his roots remained firmly planted in the Midwestern United States. Paul Harris Plaza in downtown Racine is a pedestrian park dominated by a turn of the century clock with four faces. The Rotary Club of Racine, as part of a multimillion-dollar urban development project, developed the Plaza. EVANSTON is the location of Rotary International Headquarters where you will find a variety of Rotary memorabilia as well as a replica of Paul’s Chicago law office and Room 711 relocated from the old Unity Building. The first meeting of the first Rotary Club took place in Room 711 of the Chicago Unity Building February 23, 1905. Before the Unity Building was demolished, Past Chicago Rotary Club President Norman Kloker and a group of fellow Rotarians now known as the 711 Club removed the interior of Room 711 including the furniture and stored everything until it could be reassembled in One Rotary Center. The Host Club’s Landmark Committee opened the relocated Room 711 for the 1980 Rotary Convention. The Paul Harris 711 Club, an Affiliate Member of the Rotary Heritage & History Fellowship, maintains it. A life-size statue of Paul Harris, hands outstretched, greets visitors. Given to Rotary International by the Rotarians of Japan, the statue is the product of two generations of artists and Rotarians. The head is modeled after a sculpture created by Isao Morioka and given as a gift to Paul Harris in 1935 by Umekichi Younejama, founder of Rotary in Japan. Many Japanese Rotarians are members of the Rotary History and Heritage International Fellowship. CHICAGO is the city where Paul Harris practiced law and established the Rotary Club of Chicago, known today as Rotary/One. Visiting Rotarians are welcomed each Tuesday noon. The world’s first Rotary club now holds its weekly luncheon in the “Union League Club” located at 65 W. Jackson Blvd. in downtown Chicago. (A) Harris Home, 10856 S. Longwood Drive, Chicago Readers of My Road to Rotary, the autobiography of Paul Harris, know that in 1912 Paul and Jean moved into a home “on top of the hill on Longwood Drive.” They named their home Comely Bank after the street where Jean had lived in Edinburgh, Scotland. They lived in the house until Paul’s death in 1947. In 1998 the Rotary Heritage and History International Fellowship established a committee for the purpose of buying the former home of Rotary’s founder prior to Rotary’s 2005 centennial celebration. With a loan from Naperville Rotary Club Charities, the Paul & Jean Harris Home Foundation took title to the property in May 2005 and the following month Glenn Estess, Centennial president of Rotary International, cut a ribbon formally celebrating the home’s availability for use by Rotary leaders. Upon completion of repairs and restoration, Comely Bank might become a Rotary presidential library and museum available for tours and appropriate use. While renovation continues Comely Bank may be viewed from the street. For more current information phone the Rotary Club of Chicago (312-372-3900). 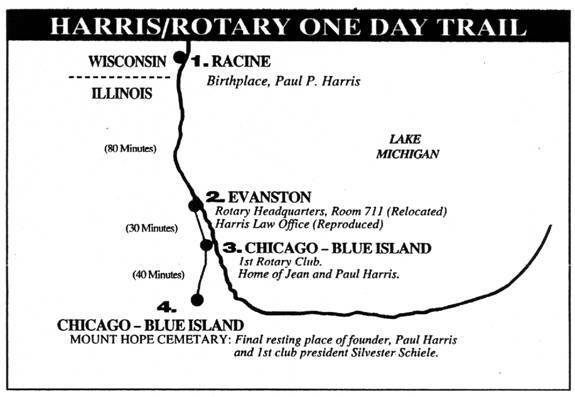 (B) MOUNT HOPE CEMETERY (near Blue Island) is the burial place of Rotary Founder Paul Harris and first Rotary Club President Sylvester Schiele. The Paul Harris Memorial Committee, an Affiliate Member of the Rotary Heritage & History Fellowship, has erected a Presidential Memorial Walkway honoring all Presidents of Rotary International. The Rotary Club of Blue Island is the caretaker of this site and provides accompaniment for visitors who contact the Club Secretary.